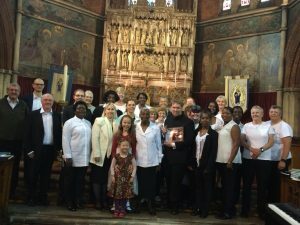 The St. Mary’s Congregational Choir (SMCC) & visiting singers from “United Singers” (based in Hornchurch) who, together with other guest musicians, supported Tom as the Parish marked his 10th year of being Director of Music for St Mary’s. In 2011, the Congregational Choir was formed and has been developing well since under the guidance of our Musical Director, Tom Rodgers. They have been a constant source of leadership in the music every Sunday. They rehearse weekly and prepare music for special feast days and liturgical festivals such as Christmas and Easter. The SMCC, as they are called, sing pieces in unison as well as in parts. Choir rehearsals are every friday, in church, at 8:00pm (7:45pm meet), and new members are always welcome.